The Dawn Redwood is the only living species in the genus Metasequoia. It was thought extinct until a small population of mature trees was found living in China in the 1940's. The trees were brought back to America and are popular planted trees. Like the larches, the Dawn Redwood loses its leaves in the fall. This specimen is a new planted tree found to the west of the Benstein-Marcus Administrative building at Brandeis University in Waltham, MA. 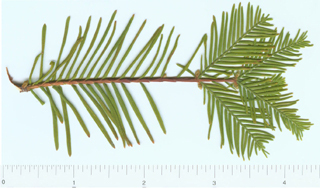 Needles grow both on green stems and woody twigs. In the fall, the green stems with all of the attached needles are lost in addition to all of the needles on woody stems. Individual needles are 1" to 1 1/2" (2.5-4.25cm) long. 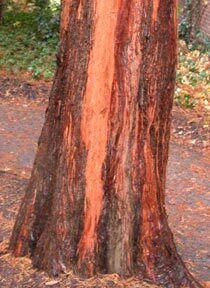 Mature Dawn Redwood bark is papery and peeling and a bright reddish orange color.